When last we left Maggie, she was escaping through the window and down a tree…. I got in my car and drove down the street in the direction of Maggie’s sudden “I can fly” moment out of our second-story window. I watched Andrew take off into the night on his bicycle. My car window was down and I could hear him plaintively call out her name as our search led us in different directions. I heard the tortured resignation in his voice and knew he didn’t really believe we would get lucky again; I didn’t believe it either. I then started my own mournful wale and Maggie’s name was soon filling the empty and darkening spaces of what should have been a peaceful late summer evening. I had the urge to shoot down as many streets as possible, but needed to go slowly to see if she had run up into a blackened corner of a driveway. I slowed even more to speak to every person I came across in hopes of a sighting or to leave my phone number. Unbelievably, about a mile from the house, a couple out with their dogs had just seen her. They said she was running at a full clip and pointed me in the right direction. There was no sign of Maggie, but then another couple said that she had just turned the corner only seconds before. I sped away, made the turn, and there she was, ears down, tail between her legs, yet moving quickly towards the busier streets outside our neighborhood enclave. I yelled out her name and she stopped. She looked right at me, but as I started to open the door, any momentary recognition was lost in her fright, and she shot off even faster than before. I caught up to her and again she stopped at her name, only to spook at any movement I made. For the next five minutes we danced to this frustrating rhythm of stop, run, stop, run. Perhaps, I thought, she was terrified of the car and would let me come up to her if I were on foot. I got out of the car and called her name. Again she stopped. Gently I called out to her and got down on one knee. She was agitated and obviously terrified, but there was a moment of recognition and then came a facial expression I had just seen in the canyon only weeks before. It was the moment right after Teddy had broken away. I yelled out his name and he stopped and looked at me. The look was one of decision making: Do I stay or do I go? He decided and was gone into the night. Maggie had the same flash of indecision and with the same outcome. She shot off into the darkness. I tried to follow, but there was no way to keep up. By the time I got back to the car she was gone. Even worse, she was now heading towards the busiest streets and nearing the freeway. I continued to search, but there were too many possibilities. I headed back to the house to retrieve my phone and find Andrew. Andrew had covered almost as much ground as I had, only his bike chain had come off and by the time I called him he was slowly walking his bike back home. I picked him up and told him my found and lost story as we drove around together, slowly combing the streets near where I had last seen her. The blank stares out the windows and our weakening cries made it obvious that we were both coming to the same conclusion: finding her was probably not going to happen. We decided that there was little more to do and we would hope that the microchip or dog tags would somehow get her back home. Still, it felt so utterly wrong to give up that I still slowly drove up and down streets as we made our way home. As we pulled up to our house, our duplex-mate, John, was standing on the front lawn talking to two young men. Worried too, I was sure he was telling everyone who walked by the house to keep an eye out for Maggie. In shock and awe, Andrew and I incredulously listened as the two young guys told the story of what had happened. They lived a couple of miles from the house and had just got home from their study group when I drove by and alerted them to our loss. Later, one of them went out to his car for something when he saw Maggie run by. He yelled to his friend and they sprang into action. They grabbed some hotdogs from the fridge, got into their car, and started to follow her. Like me, they couldn’t get her to come near them. They decided to just follow her and not let her out of their sight. She ran; they pursued. Each time she came to a busy road or intersection, they would block the street with their car to ensure that she could cross without getting hit. She ran south from their house towards the freeway, then west through a quiet neighborhood. Turning north, she made her way to the very busy Pico Blvd. Suddenly going west now, she made it to Beverly Hills. Up Rexford, right on Olympic, back down Robertson, she ran; they followed. They blocked the streets and she crossed. They had no idea where she was taking them, but they just kept close. Soon she was back to Pico and a few blocks later turned down Cashio about five blocks from our house. She ran on, turned right onto our street, made it a few more blocks, crossed our lawn, shot up the stairs, through the door I had left open in my hurry to chase after her, and straight to my bed where she was curled up, waiting for someone to arrive. All tolled, she had run more than five miles before finding her way home. She had headed out on her own “Incredible Journey” and somehow navigated the streets back to our house. I half expected to find some ratty cat and another mutt she had picked up along the way. I was so happy to have her home that, like the movie, I would have probably have taken them in as well. I don’t know how she managed to find her way home. I had only walked her that way one time and then only partially. Yet, somehow she did. She had wandered lost among the streets and migrant-worked fields of Bakersfield before she was rescued, only to find herself back into the chaos of a city that didn’t seem to care. It’s easy to put human emotions onto our animals, but I can’t help imagine her doing everything in her power to get back to a home that had given her a brief glimpse of what life could be like when you are safe, well fed, and loved. As incredible as the story was, the actions of those two guys moved me. It’s easy to get jaded when you live in a big city, but between my mother’s illness and now losing two dogs, my experiences have shown me that the human heart is alive and well. Even in Los Angeles. Later that evening, the softness of summer nights crept back into our lives. Andrew and I were sitting on the couch watching TV with Maggie stretched out to make sure she was on both our laps. Truman was curled up at our feet. I looked over at the two sitting next to me and Maggie’s German shepherd markings seemed to blend and flow right off of Andrew’s light brown skin and jet-black hair. It didn’t’ escape me that the resemblance was far more then skin deep. I saw in Maggie’s eyes the unsure and agitated look that Andrew carried with him when he first came to live with me. I could feel in Maggie the twitch and impulse to bolt at the drop of a hat. I don’t know why I had decided to take on yet another responsibility, and I started to doubt my ability to handle the added stress. Then I looked at Andrew: confident, calm, completely at home in every sense of the word; the emotional resemblance he shared with Maggie was of an Andrew long gone. This Andrew knew he was safe and loved. This Andrew knew he was home. I rested my hand on Maggie’s head and started to relax back into the evening. She was going to be fine. We all were. Fourth of July for Chilean! I moved to Chile for two years when I was only 19 years old. My food tastes had really not developed and there were still many things I didn’t like to eat. However, the sheer exuberance of living abroad as a young man made every experience special and unique. Food was no exception and I sought out every opportunity I could to try something new. So much so, that I when I left for Chile I weighed 150 pounds and when I returned I was a robust 190! The weight eventually came off, but not my love for many Chilean dishes. I still dream about the early morning visits to the fishermen’s beach in the northern port of Antofagasta. We would be at the fishmongers’ tables as a fresh batch of abalone the size of a small fist would come in. We would get a dozen for one dollar and our pension “mom” would turn them into lunch for us. Chileans love their food almost as much as their freedom. I lived in Chile while Pinochet was still in power. Even with his oppressive regime looming over the people, you couldn’t keep their freedom loving spirit down. Chile had the first democracy in Latin America and it would be many more years before they would get their freedom back, but Independence Day was still celebrated each September 16th with much passion and fanfare. 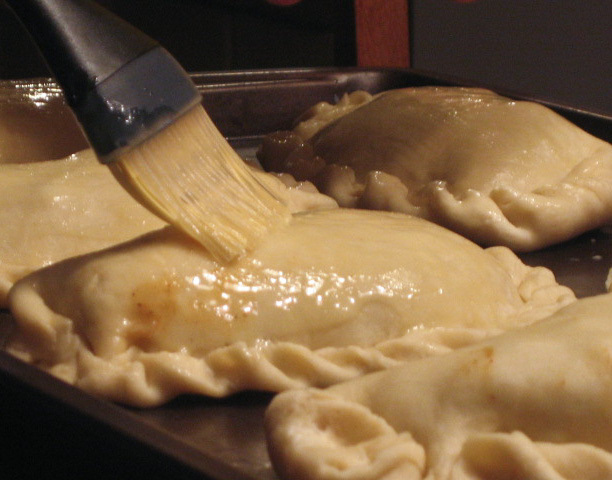 The empanada is to Chilean Independence Day what hamburgers and potato salad are to our Fourth of July. 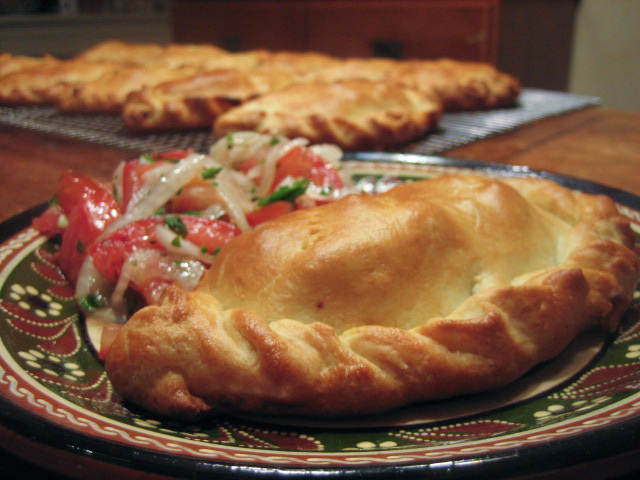 In fact, the empanada could easily be called the Chilean national food. Argentineans will argue that the empanada is theirs but, for my money, Chile has this one in the bag. I learned to make this along side the many “momitas” or “little mothers” whom we paid a small amount to each month to live in their homes. They would cook us three meals each day, clean our rooms, and take care of all our needs…just like our moms. Like most national recipes, variations abound. I’ve been making this version for 25 years and it was what I served at my very first dinner party while still in college. This is an Andrew favorite. The dough is easy to make and can rest while you are making the filling. You can also make both the dough and filling a day ahead and assemble them the next day. Note: You can use lard, Crisco, butter, or a combination. 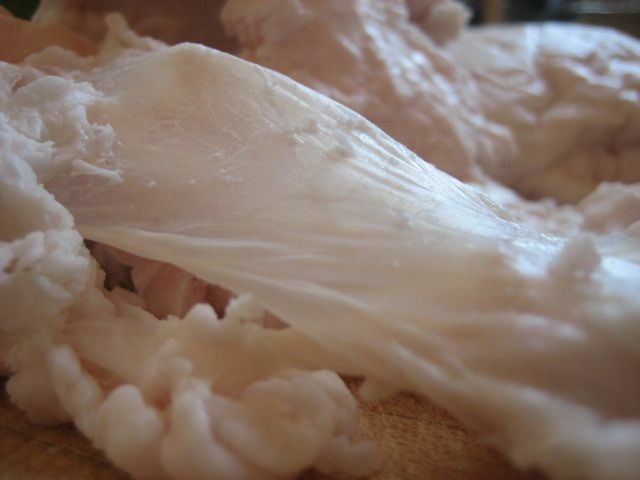 I must admit that I render my own lard from organic pork leaf lard (see photo) and this will give you one of the best doughs you will ever eat. If you have lard or leaf lard available, you should try this once in your life to see how good dough can really be. Blend the flour, baking powder, and salt together. Add the Crisco and using your hands, mix it until it is fully incorporated and resembles little pea-size pieces. Add the milk, a little at a time, until you have a soft and supple dough. Wrap the dough in plastic wrap and chill for at least twenty minutes or up to an hour or so. Note: Chileans wouldn’t know what brown sugar is and would use a less refined version called Chancaca. You can find it in Latino markets under the name piloncillo. If you use piloncillo, it is a hardened piece of sugar and you will have to cut off a good size piece and dissolve it in about ¼ cup warm water. Sauté the ground beef until it just loses its pinkness and drain off the fat. Meanwhile, sauté the onions until translucent; add the paprika, garlic, oregano, parsley, brown sugar and the flour mixed with enough water to make a runny paste. Sauté over medium low heat until it has a creamy consistency and flavors meld together, about 15 minutes. Take off the heat and let cool. Divide the dough into 10 to 12 balls and roll each section of dough into a circle 6 to 8 inches in diameter. 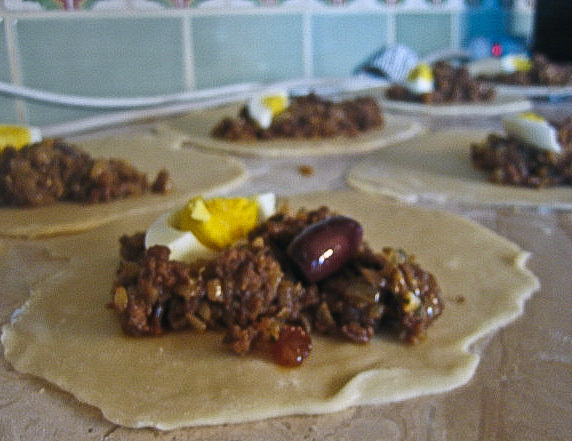 Place about ¼ cup meat filling on each rolled out dough piece and place a slice of egg on one side, an olive on the other and sprinkle 4 or 5 raisins on top. Wet the edges of half the circle and fold the other half over the meat filling; press the edges gently together. 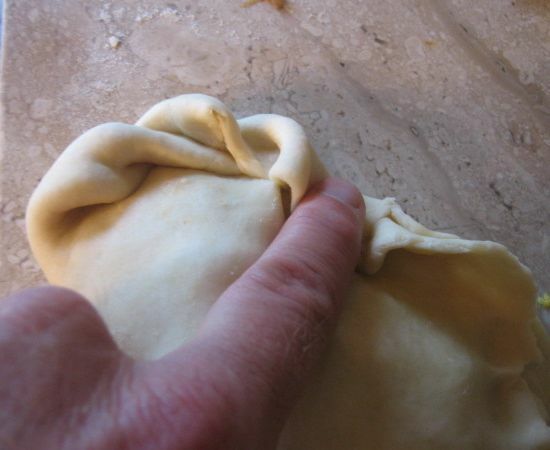 Using the index finger of your left hand as a guide, start at the top of the empanada and fold a little bit of dough over your fingertip. 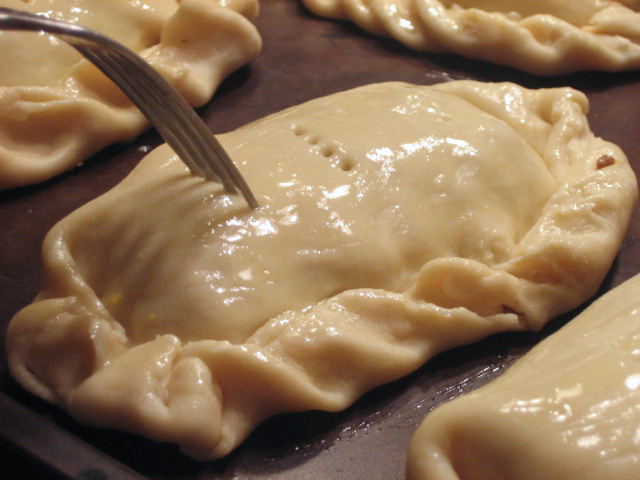 Repeat this all the way across the empanada until it is firmly sealed with a decorative fold. The Chilean seasons are opposite of ours, and I arrived in Santiago amidst the sweltering temperatures of a January summer heat wave. Think New Year’s Day in August! 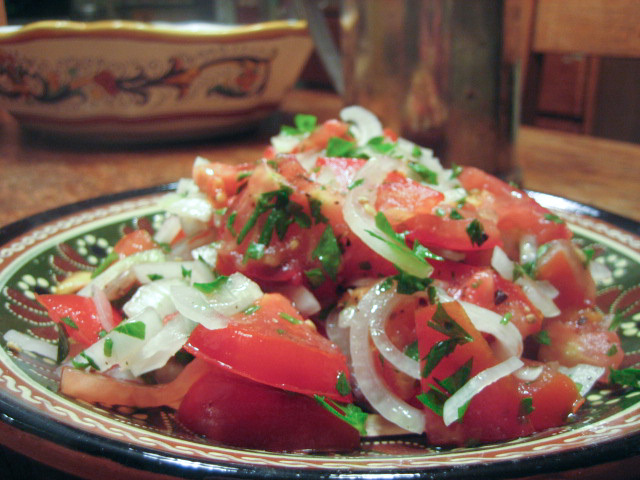 My developing taste buds couldn’t stomach tomatoes or onions, and I was served this salad almost every day for the first two months I lived there. For a Chilean, this salad captures the flavors of summer and the colors of Christmas and would be a regular part of the holiday table. It wasn’t long before this salad felt like a celebration for me too. Andrew, too, has long since stopped picking out the onions and loves this as well. Note: Raw onions can be really pungent. Using a sweet variety will allow you to keep them crisp and very fresh. However, most Chileans will heavily salt and soak the onions in cold water, repeating the processes a couple of times until the onions are wilted and mild. Sprinkle the tomatoes with a little salt and mix with the onions, drizzle with the olive oil and vinegar, if using, and toss well to marinate. Before serving, mix in the parsley or cilantro. This is great with empanadas and also great with grilled meats and fish. 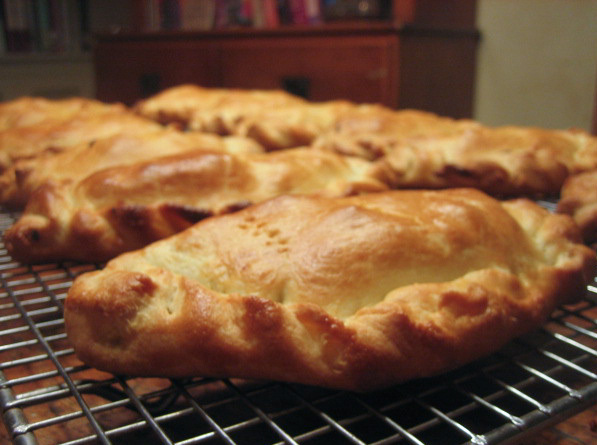 Empanadas are one of my favorite foods and those look absolutely divine! Happy to hear Maggie made it back home. I have not been checking a lot of my usual places because life and weekends have been unusually busy until a week or so ago because of a local Renaissance Festival, but I’m glad I looked tonight. I remember that heartbreak well.